The MacDougalls of Argyll are the senior lineal descendants of Somerled k. 1164. Sumarlidi, his Norse name, means “summer traveller” a by-word for a Viking in the sense of “sea raider”. The Gaels called him Somerle Mor MacGhillebhride – Somerled the Mighty, son of Gillebride. This patronymic name reveals his mixed Norse-Gael ancestry which means that his family were Gall-Gaedhil “foreign Gaels”. Somerled’s son, Dugal MacSomairle (Gaelic “son of Somerled” pronounced MacSorley) was first mentioned in 1155 in the Chronicle of Man when local chiefs asked for Dugal to replace his uncle, a tyrannical King of the Isle of Man. In 1156 after an overnight sea battle, King Godred of Man divided his island kingdom with Somerled and Dugal. Thus Somerled became Norway’s ruler of the southern Hebrides and “King in the Isles” while ruling the adjacent mainland of Argyll for Scotland. Dugal, the eldest, inherited several islands and mainland Argyll which became his clan’s territory. 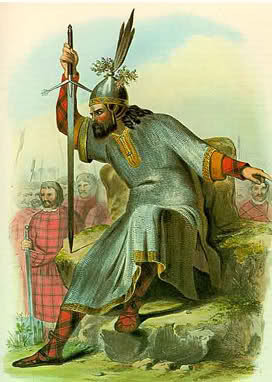 Dugal ruled as the first chief of Clan MacDougall of Argyll until his death in 1207. His sons would be identified by the Gaelic patronymic MacDhùghaill i.e. “Mac Dougall”. The records concerning Somerled are scarce. Somerled belonged to a Norse-Gaelic family of some importance. His father, Gillebride, seems to have descended from a line of rulers of the Hebrides for Norway. Gillebride appears to have lost power and fled to Ireland and mainland Argyll when Magnus Barelegs raided and pillaged the Hebrides about 1098. Somerled may have been born in northern Ireland about 1110 during this time on the run. He grew up fighting to take back his father’s rightful position as governor of the Hebrides Isles for Norway. By about 1130 Somerled seems to have taken over leadership of his father’s remnant forces and gradually built them in to an effective fighting force in mainland Morvern, then began the gradual recapture of the nearby isle of Mull, followed by gradual conquests of the other isles and mainland territories of his Norse enemies. In this his use of the “Nyvaig “little ship” proved invaluable. This was a smaller more manoeuvrable Hebrides version of the Norse ships. Somerled’s first wife may have died in during the childbirth of his first born son Gillacolm. By about 1140 Somerled was secure enough and powerful enough to marry his second wife Raghnild. She was a natural daughter of Olaf the Red, King of Man and the Isles. In 1153, Somerled supported his sister’s husband Malcolm MacHeth of the House of Moray in his revolt against the newly enthroned Malcolm IV, King of Scots. MacHeth was likely related to the Scots royal family and felt an entitlement to the crown. Following this unsuccessful rebellion, Somerled appears to have turned his sights upon the kingship of the Isles, then ruled by Godred Olafsson, King of the Isle of Man and the Isles. This unpopular King was the half-brother of his wife Raghnild. Godred Olafsson with his brothers had murdered their father Olaf in 1153. When local chieftains from the Isle of Man asked for Somerled’s son Dugal to be their King in place of Godred Olafsson who was away in Norway, Somerled used his forces to replace Godred with Dugal. Two years later in 1156 Godred Olafsson returned with a fleet of his own and the two sides battled near the Isle of Islay in a bloody overnight sea battle fought on the eve of the Feast of Epiphany in January 1158. They fought to a draw and in the morning agreed to divide the Kingdom of the Isles with Somerled getting Islay, Mull and other isles south of the point of the Ardnamachuran peninsula of Argyll and with Godfrey keeping The Isle of Man and the isles north of the point of Ardnamachuran. Two years later Somerled took the remainder from Godred and held it all as “King in the Isles” for Norway until his death in 1164 when it was assigned by the King of Norway back to Godred. Somerled had signed a peace treaty with Malcolm IV King of Scots in 1160 and did homage to the him for his mainland possessions. A year later in 1161 Malcolm IV had taken Galloway away from Prince Fergus and then in 1163 attacked Moray. This represented a steady expansion of Scots power outwards towards the semi-independent Norse-Gaelic western fringes of the kingdom. It appears that Somerled launched his own pre-emptive strike. Somerled’s army came from Kintyre, the Hebrides, Argyll, and even had Vikings from Dublin. According to the Chronicle of Man his army sailed up the Clyde river to Renfrewshire in 160 ships. This would carry a force of about 6,000 to 7,000 men. The reasons for his attack were not specified but seem to have been aimed at defeating Walter fitz Alan, 1st High Stewart of Scotland and a Norman. The Normans had been invited in to the country by the Kings of Scots to be supporters of a strong central crown with their imported feudal system with its written charters. They were soon encroaching on the old families of Scotland and their territories. The semi-independent Somerled and the Gaels of his territories with their oral traditions and unwritten rights would be their natural enemy. The scale of Somerled’s venture suggests that he nursed greater ambitions as well. However Somerled’s force of lightly armed infantry would prove to be no match for even a few of the armoured cavalry used by the Normans. The battle occurred on the south side of the Clyde River a few miles to the west of Renfrew castle near the village of Elderlsie and the site the present Glasgow Airport. It is possible that Somerled intended to attack the Walter fitz Alan the 1st High Stewart of Scotland, whose power base was at Renfrew. Somerled had previous conflicts with the Stewart over the islands such as Aran and Bute in the Clyde River mouth. It is uncertain what forces the invaders met but it is possible that it was a body of feudal knights who would have been much more heavily armoured than his forces. In the battle that followed, Somerled and Gille-Bridget his eldest son by his first wife (who has also been called Gillacolm) were killed by the defenders before the few survivors escaped in the ships. … And in the first cleft of battle the baleful leader fell. Wounded by a javelin, slain by a sword, Somerled died. And the raging wave swallowed his son, and the wounded of many thousand fugitives; because when this fierce leader was struck down, the wicked took to flight; and very many were slaughtered, both on sea and on land. It is uncertain where Somerled was buried but it may have been in Saddell Abbey in Kintyre or perhaps on the isle of Iona. Somerled’s territories were divided amongst his three surviving sons of his second wife Raghnild, the eldest son being Dougal the progenitor of clan MacDougall, and the second eldest being Reginald the progenitor of Clan Donald, and Angus the third son was the youngest of the three. Compared to his immediate descendants, who associated themselves with reformed religious orders, Somerled may have been something a Celtic religious traditionalist. In 1164 he attempted to persuade Flaithbertach Ua Brolcháin, Abbot of Derry and head of the Columban monastic community, to relocate from Ireland back to the isle of Iona. However, Somerled died that year without achieving the reunification he sought, and decades later his descendants oversaw the obliteration of the island’s Columban monastery. The oldest surviving building on the island, St Oran’s Chapel, dates to mid twelfth-century, and may have been constructed by Somerled or his family. Traditionally imagined as a Celtic hero, who vanquished Viking foes and fostered a Gaelic renaissance, contemporary sources instead reveal that Somerled operated in and belonged to the same Norse-Gaelic cultural environment of his maritime neighbours. 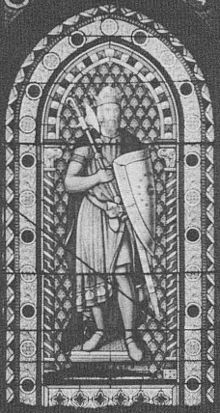 Somerled is regarded as a significant figure in twelfth-century Scottish and Manx history and a significant protector and of Gaelic language, culture, and territory. Somerled is proudly claimed as a patrilineal ancestor by several Scottish clans. Recent genetic studies suggest that Somerled has hundreds of thousands of patrilineal descendants, and that his patrilineal origins may lie in Scandinavia. Since the early 2000s, several genetic studies have been conducted on men bearing surnames traditionally associated with patrilineal descendants of Somerled. The results of one such study, published in 2004, revealed that five chiefs of Clan Donald, who all traced their patrilineal descent from Somerled, were indeed descended from a common ancestor. Further testing of men bearing the surnames MacAlister, MacDonald, and MacDougall, found that, of a small sample group, 40 percent of MacAlisters, 30 percent of MacDougalls, and 18 percent of MacDonalds shared this genetic marker. These percentages suggest that Somerled may have almost 500,000 living patrilineal descendants. The results of a later study, published in 2011, revealed that, of a sample of 164 men bearing the surname MacDonald, 23 percent carried the same marker borne by the clan chiefs. This marker was identified as a subgroup of haplogroup M17, known to be extremely rare in Celtic-speaking areas of Scotland, but very common in Norway. Both genetic studies concluded that Somerled’s patrilineal ancestors originated in Scandinavia.